Joy Creek Photo Archive (c) all rights reserved Veronica surculosa's tiny, scalloped gray green leaves are softly haired and the terminal clusters of cornflower blue flowers have white eyes. 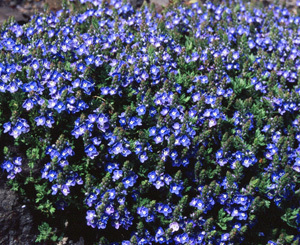 Try this little gem in a rockery, a trough, or draping over a wall. Late spring to early summer. 2 in. x 2 ft.